Around 1900 Russia and Germany were not only dynastically, but also culturally and economically closely connected. Almost 10% of the thermal spa of Badenweiler, the small summer residence of the Grand Duchy of Badenweiler, came from the Russian Empire at that time. The seriously ill Anton Chekhov, too, arrived in 1904, but succumbed after only a few weeks to his lung disease, from which he had suffered for over 20 years. Four years after his death Russian friends and admirers, among them the famous director of the Moscow's Art Theatre, Konstantin Stanislavski, established a monument for the foreign author Chekhov in Badenweiler - the first monument to any Russian outside of his homeland. At the time, world citizenship, art appreciation and tolerance were still victorious over the constantly growing nationalistic hubris of the Wilhelminian Empire. Even just a few days before the cannons of the First World War started to thunder, the Chekhov monument was once more witness to a German-Russian peace and memorial celebration. Then the cosmopolitan culture of "old" Europe in the West as well as in the East went under, and with it the monument, which was surrendered to a metal collecting drive for arms purposes. For many years, Chekhov and his work remained the victim of adverse political conditions. Not until 1954 did Badenweiler remember its lost literary tradition and, in the middle in the Cold War, began to attempt reconciliation with the former enemy, the Soviet Union, and to fetch the Russian writer back into the collective memory. After that, the history of Anton Chekhov's literary reception in included many attempts to clear the way towards "relaxing" the relations between east and west despite the obstacles frequently created by international politics. Badenweiler benefited further from the fact that from the 1960s on Chekhov was the most performed dramatist in the German-speaking world: his anti-ideological, analytically distanced style of writing and seeing things conformed to zeitgeist of the post-war society and made him into one of the initiators of the literary modern age worldwide. July 17, 2015 the new literature museum "Tschechow Salon" was inaugurated in Badenweiler. 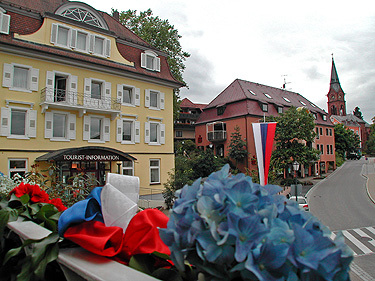 The event was hosted by Mayor of Badenweiler Karl-Eugen Engler and was attended by the following guests: Sergey Maguta - cultural attaché of the Russian Embassy in Berlin, Professor Vladimir Kataev - head of the Chekhov Commission at the Russian Academy of Sciences, Johannes Dreier of Freiburg city council, Professor Rolf-Dieter Kluge - chairman of the German Chekhov Society, Dmitri Bak - director of the State Museum of Literature in Moscow, Dr. Konstantin Bobkov - general director of Chekhov Literature Memorial Estate in Melikhovo.